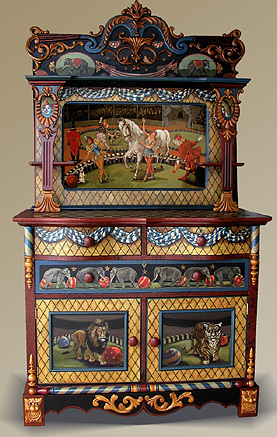 "Three Ring Circus" is painted on a turn of the century oak sideboard. The top had been stored for years in an attic. It's amazing that it survived intact! I really enjoyed reinventing this piece. The sideboard's ornate applied carved decoration, columns, and curved drawers reminds me of the circus wagons that carried the animals, band, and clowns of the "Big Top" Circus.